Security guard Mike Dargy has been placed on leave after allegedly making a racist comment to a bartender in Westport. Note: This post contains racist content. A Westport security guard has been let go after a Facebook post detailing a racist incident in Westport gained traction Monday. 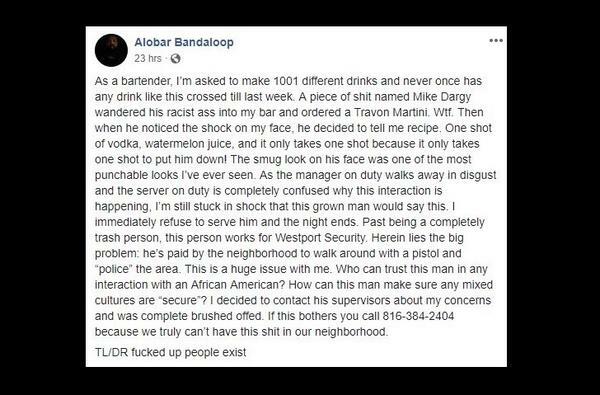 According to the post, the bartender, who goes by Alobar Bandaloop on Facebook, says the alleged incident occurred over the weekend, when Mike Dargy went to Buzzard Beach and ordered a "Trayvon Martini" from him. Trayvon Martin was the unarmed black teenager shot and killed by George Zimmerman in Florida in 2012. Since the post began to circulate, Dargy has been placed on leave by his employer, Chesley Brown International, a private security company that supplies guards for the popular entertainment district. In an email, Dargy told KCUR the Facebook post was "extremely embellished." He declined to provide further details. In a statement, executive director of the Westport Regional Business League Kim Kimbrough said the allegation is under investigation by the security company. "If true, it is reprehensible; and we will have zero tolerance for that type of behavior in this welcoming district," Kimbrough said. Chesley Brown International, an Atlanta-based security services firm, said in a statement it launched an internal investigation after finding out about the alleged incident. The company has since fired Dargy and plans to re-evaluate its cultural sensitivity training. "We want to make it clear that these types of actions in no way represent the principles of Chesley Brown International," said Candice Cade, Associate Vice President of Human Resources, in the statement. According to Olathe Police spokesperson Logan Bonney, Dargy was a recruit officer for the department for less than a year, leaving the department in 2016. Bonney could not provide the reason Dargy left the department. 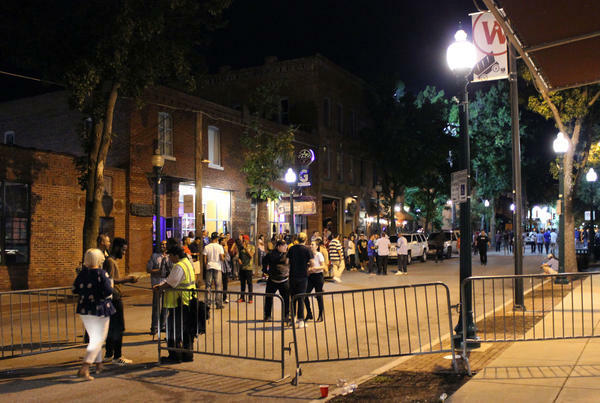 The alleged incident calls to mind concerns voiced last fall about racism in the entertainment district, and the potential for racial profiling if City Council approved the Westport privatization ordinance, allowing gun screening sites at the edges of Westport. Councilwoman Alissia Canady, who voted in favor of privatization, added "safeguards" to the ordinance, including calling for racial bias training for officers and guards, and for "civil observers" to work busy weekend nights at the screening sites to monitor for racial profiling. "When people are observed they usually do what's right. When they're not observed, their unconscious biases come out. That was why I required the civil observers to make sure there was accountability," Canady told KCUR. As for the racial bias training for guards and officers, Damon Daniel of the Ad Hoc Group Against Crime confirmed with KCUR that a class was hosted by the Anti-Defamation League back in April, which would have been during the time Dargy was employed as a Westport security guard, according to an email he sent to KCUR stating he had been working in Westport for two years. Daniel was at the training in April because he was tasked with hiring a staff of 11 civil observers. The observers participated in one day of racial bias training alongside Westport security guards and Kansas City police officers. Daniel told KCUR it was a "good start." "But, one day is never enough," he said. "It takes practice. It's not something unlearned overnight."